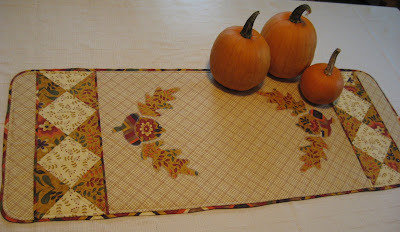 Hooked on Needles: Fall into Fall with this Awesome Fall Table Runner! Fall into Fall with this Awesome Fall Table Runner! It has finally arrived! My very favorite time of year has begun ~ fall! Here in New England, all the trees are turning their beautiful fall colors of red, orange and gold. The apples are ready for picking and eating. The bright orange pumpkins are ready for cooking or carving. The days are sunny and not too hot, and the nights are cool and crisp. The children are well established in their new school routines and my husband is happy that football season is in full swing. I'm excited too because today is the beginning of the Fall into Fall Giveaway hosted by Debi and featuring over 100 great giveaways from around the world. When you're finished checking out my giveaway below, make sure to pop over there and check out the long list on her sidebar of all the other giveaways offering great prizes too! 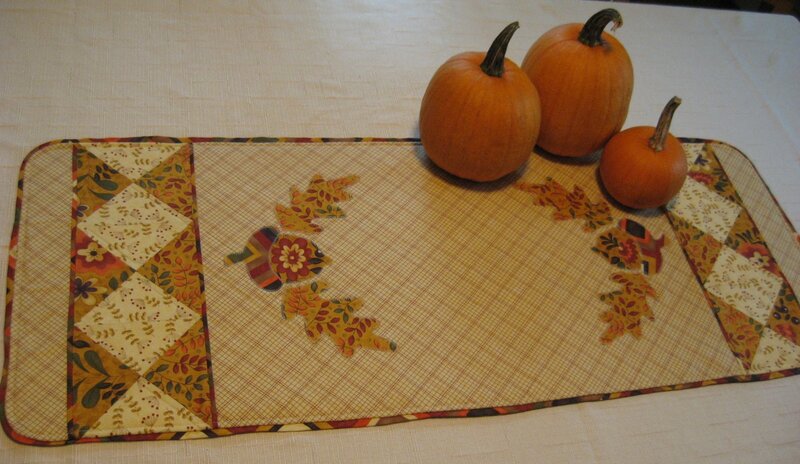 ...It's a fall table runner made with fabric from my very favorite fabric designer, Sandy Gervais. The fabric line is called Awesome, and it really is! So when I talk about my Awesome prize, I am not really patting myself on the back, although I do think it is awesome, but that's just the name of the fabric I used! This table runner measures a generous 16 by 39 inches and is my own original design, which will be available in my Etsy shop soon. It features a no-binding finishing technique so if you don't like to do binding, this is the pattern for you! Below are all the ways that you can get your name in the hat for this Awesome prize. Just make sure you leave a separate comment for each one that you do, and make sure I can contact you by email. If I cannot contact you by email, your entry will not be counted. Browse through the Hooked On Needles links at the top of my sidebar and choose a project I have featured that you think best represents the fall season. You'll find lots of options under knitting, crochet and quilting especially. Leave a comment telling me which project you picked. Follow Hooked On Needles through any of the options listed on the sidebar such as Facebook, Networked Blogs, RSS or Feedburner subscriptions. Leave a comment telling me how you follow Hooked On Needles. Share this giveaway with your friends on Facebook or Twitter by posting the link to this giveaway on your Facebook or Twitter page. Leave a comment telling me which one you did. Post about my giveaway on your own blog and link back to this post. Leave a comment with the link to your post so I can come and visit too! Browse my Etsy shop and add it to your favorites by clicking Add to Favorites on the sidebar under Actions. Leave a comment telling me your favorite item in my shop. So you have five chances to enter my giveaway. Read them carefully and then do just one or do them all, it's up to you! I'll draw the winner on October 15th. I'll also draw a second winner for a surprise prize which I will reveal at some time before the end of this giveaway. Please forgive me ahead of time for not responding to each comment left on this giveaway post. Let me offer my heartfelt gratitude and appreciation for your visit to Hooked On Needles today and I hope you will spend some time browsing or come back again when you have more time. Don't forget to go over to Debi's list of other giveaways participating in this fun fall event. Good luck to you in whatever giveaways you decide to enter! I'm so glad a few people are posting early - so many giveaways to peruse. I picked the sweater made from Bubblicious as the thing to represent fall. So colourful, which fall is. Mary Maxim does have some cute things. And I follow your blog on Google Reader and I follow you on Facebook as well. Ok, I'm going to be the first one to comment! Woo hoo! I love your Awesome tablerunner, it is simply AWESOME. I know, I'm sorry, I had to do that! It is beautiful and I love it. Fall is my favorite time of year too and I'm so glad it is here. Thanks for participating in the Fall into Fall Giveaway! I'm already a follower and I get your emails daily...I love them. I'm also participating in the Fall Into Fall Giveaway so please drop by to see me. I just love your Knitted Colorful Rings Tube Scarf, it is so cute and I love the colors...put it with a fall sweater and go play in the leaves. So cute! I would love to think that I might be your first comment, Mary Grace. You know that I love that Awesome fabric, too!! And how do I follow you.....on Facebook/Networked blogs!! Your tablerunner is gorgeous!!! I went into your sidebar and followed the quilting link - I like the red and aqua disappearing nine patch quilt you have done. I know its an old and much done design but one which is very appealing. I also liked the mix of aqua and red. I have seen this color combination several times and have not attempted it. Maybe its now time! Thank you for offering a giveaway on your blog. I am definitely a follower and I just love the runner...adorable! 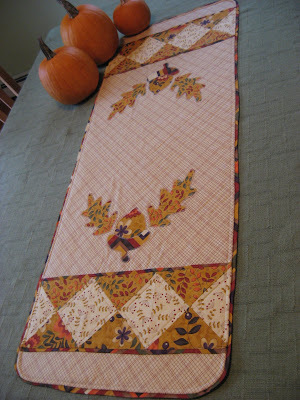 what a lovely fall table runner! I would love to win that! 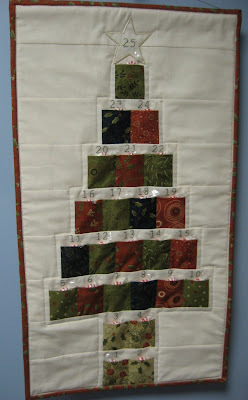 I looked at your projects and chose "Disappearing 9 Patch Scrappy Quilt" as the fall project. The colors are so nice and warm and it looks cozy for colder days. I am a follower of your blog by my blog. your halloween apron is adorable. THank you for the chance to win. I love when I can pull out my fall decor and decorate. Thanks what a great giveaway..It is also on my blog.. come by.. I've made four projects already this Fall using her Gobble Gobble line. I have to pick the Halloween Apron. I love how it is reversible so you can wear it all through fall. Very clever. What a beautiful giveaway prize..it is so pretty! Clever idea on the Halloween apron, it's very cute. Thanks for the chance to win your lovely table runner. Stop by my blog for the fall giveaway as well. I have a table runner up for grabs also. Happy Blog Hopping! Awesome tablerunner - you better pat yourself on the back - this is a great giveaway. I like the tote bag tutorial! You always make fantastic bags! Thank you, the table runner is gorgeous! I am a follower too, thanks once more! Sharonj. I love the daisy galore quilting on your charity quilt...what a beautiful job! Your tablerunner is awesome, too!!! Thanks for the chance to win your giveaway! I think the http://www.hookedonneedles.com/2009/04/free-pattern-tunisian-crochet-apple.html represents fall! I think the Halloween apron is a good project for fall! I thought your Let Us Give Thanks counted cross stitch was very nice for the fall season. The tablerunner is beautiful, and I would love to have it on my diningroom table. I think the scrap quilt you made for your daughter represents fall to me. The little of this and that to make a warm comfy pass me down from generation to generation. I imagine sewing in a rocking chair next to a kettle by the fire. The "let us give thanks" project is perfect for Fall and for Thanksgiving. I like the sweet and rosey needle wallet. Since I do not crochet I love the Jacobs Ladder scarf! Very cute! Your etsy shop is definitely on my favorite list!! i love your apple dish cloth. i have never been able to figur out how to knit, though i've tried and tried. i love useing knitted dish cloths. in the past i've gotten them from ebay, but that was before i knew about etsy. surely someone out there sells knitted dish cloths in their store. but i would love a set of these dish cloths to use year round to renind me of my favorite season, autumn. i follow your site by feedburner, and am so glad i do. you have added so many things since i last visited. though my favorite is still the knitted scarf with rings. my daughter would love it. What a beautiful table runner. I think the cozy crocheted afaghan represents fall the best. Happy Fall! Fabulous giveaway! I think the Halloween apron is the most Fall-y! LOVE the runner. I shared the giveaway on my facebook page and on my blog. I like the dr. seuss hat pattern. I taught my son to knit(he had a stroke at birth) and knitting is a great way to improve hand coordination. He will love that pattern. I love the fall fabrics of Sandy Gervais- they look absolutely beautiful- Thanks for the opportunity to win such a nice prize. I would love to win this giveaway, it's beautiful! Thank you for this Awesome giveaway. The tablerunner is lovely. Fall is special to me because of my late October birthday. My favorites are the various I SPY quilts that you have made. I've been thru the tutorial posts several times before. I think it is awesome that several bloggers are giving away things that are already made. Note that I have subscribed via feedburner and look forward to reading your blog. Just gorgeous! Crossing my fingers that it will be on MY table soon!! I love your nine patch - it's always been my favorite pattern. participate in the Fall giveaway! The tablerunner is beautiful. I'm sure the pattern will sell well! I browsed your site and think the edible sugar leaves are brilliant and a FANTASTIC fall goodie. it appears to be just me, but your blog/site is difficult to navigate with all this "other stuff' that sends me somewhere else completely. I did find something easily of YOURS and not other places, the petite point flower tablerunner which is very cute!! Criss Cross Applesauce with the reds and golds is perfect for fall! I really like the Sandy gervais awesome runner. Funnily enough I was in our LQS yesterday looking at that very same fabric. Didn't buy it~had to spend my $$ on batiks. I also love your petite points table runner. Even though that one is Spring, it would be "awesome" in fall colours! Your Halloween apron is sooooo cute, what is more fall than Halloween! Thanks for such a wonderful giveaway! I follow via FB (under my name, Piroska). Promote your giveaway on the new Quilty Giveaways site (it's free) help me grow a one stop site of fellow quilters that are hosting giveaways. Don't forget to follow the new site too! I think the Tunisian Crochet Apple Dishcloth represents fall...crisp red apples! and i love the Urban Chiks Quilted Tote Bag! I would hav to say it's a toos between the Daisies/Butterflies Cross stitch and that darling little doll quilt. I think I have that LA book and that x stitch pattern (on my "one of these day's" list) I've bookmarked you so I can come back and spend more time here browsing around. Thanks for the chance to win that table runner. I just became a follower on Networked blogs. Thanks for the chance to win your pretty table runner. Great blog hop. I love your reversible Halloween apron! You are so creative Thank you for participating in the blog hop and for the Awesome gift you are giving!!! I love the apple quilt retirement gift! The apple fabric makes me think of fall, of course, but also the school theme, and in the fall school starts again. Great job on the table runner; I'd love to showcase that on my table! When I think off fall I think about halloween so my favorite project is the halloween apron, that is just so beautiful. I follow you through my google reader, this is for me th best way of keeping track of all new post on blogs. it works for me !! I love your Criss Cross Applesauce for a Fall quilt. Beautiful. i love love the Knitted Colorful Rings Tube Scarf. cosy cute and very fall! I visited your Etsy shop and added it to my favorites. I like all of your hotpads/potholders. I love the crocheted ones. They are pretty, wash easily, and do the trick. I follow your blog! Would love to win!! I've just become a follower via facebook. I really like your Dr. Seuss scarf. It reminds me of fall because it's getting chilly in Vancouver, BC and I had to find a scarf this morning...and because I think it'd be a fun Halloween costume to go as the Cat in the Hat! I love that table runner... thanks for the opportunity and inspiration. Awesome giveaway! That runner is so pretty! I checked out your crochet! (My second favorite thing to do after quilting!) I love the slippers made with the sock yarn! And the pineapple doily! Thank you for your giveaway! Please enter me. Thank you! I think the cross stitched piece, Let Us Give Thanks, best represents the season. It's beautiful. i signed up to follow your blog through Networked blogs. I have happily added your Etsy shop to my list of favorite shops. You have some great items for sale. I'm glad to have discovered it. I've posted a link to your giveaway on my facebook page. What a beautiful table runner. I like the Halloween Apron wat a cute idea. I checked out your Etsy shop had to put in my fovoriets love the Rosary Bracelets will have to order some for Christmas qifts. I just found your site by chance...I'm absolutely in love. Thank you for sharing all your wonderful projects. The Rosary bracelets that you have created are spectacular. I think your pink and purple afghan you just completed "feels like fall" to me. While the colors don't scream leaves changing and fall colors, the weight and the bulk needed for this time of year yell fall cool air to me. All your links are great. The Apple Retirement Quilt feels like Fall to me. Thanks for a great giveaway. I like the rosary bracelets. I just love your Halloween apron, it is awesome. You have done some amazing work. I love the counted cross stitch "Give Thanks" is beauiful. The stitching and the colors are something to be thankful for in the fall. I think fall is best represented by the Apple Quilt...it's lovely! I subscribed to your blog with google reader! I am entering for my daughter Mel, her computer is down and she called and asked if once again I would enter her in contests, I couldn’t say no as she helps my wife and her mother with their charity quilting projects. I try to support them any way that I can. For me, your Let Us Give Thanks cross stitch project you did for your parents in 1995, repesents the Fall season to me. It's such a classic design that it doesn't scream 1995! It could have been any era. Thank you for sharing those pictures of it with us! I really like the mitered squares baby blanket. I think your scrappy D9P quilt reminds me the most of fall because of all the colors and textures used in it. The disapearing 9 patch scrappy quilt is one of my favorites. Your table runner is beautiful. Hey Mary Grace...almost missed your Fall Giveaway..LOL! I like your Easy Single Crochet Afghan Video Tutorial...pretty fall color, for sure! Mary Grace...I have your blog bookmarked at the bookmarks toolbar...I also follow you on Facebook! You are always up to something fun...so creative...love all your creations! I went looking at your quilts and got lost looking at them all - I do like your apple quilt and it reminds me that apples are at their best in autumn/winter as that's their true season. Now must go back and explore all the links...wow! I love the Halloween apron. Awesome, is right, I love it! I found a Halloween apron that was cute under the sewing links. I'm a new follower! Thanks for the great giveaway. The runner is beautiful.